Millions of viewers tuned in to watch Christine Ha sweep the thrilling Masterchef Season 3 finale, and here they can find more of her deftly crafted recipes. 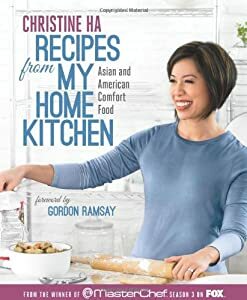 They’ll discover food that speaks to the best of both the Vietnamese diaspora and American classics, personable tips on how to re-create delicious professional recipes in a home kitchen, and an inspirational personal narrative bolstered by Ha’s background as a gifted writer. Recipes from My Home Kitchen will braid together Christine’s story with her food for a result that is one of the most compelling culinary tales of her generation. You can get the book here. Christine Ha is the winner of Season Three of MasterChef. Legally blind, she wants her skill to inspire others with disabilities that anything is possible. She lives in Houston, where she is completing an MFA in creative writing at The University of Houston. This entry was posted in book, food on May 31, 2013 by Kevin Hsieh - channel APA. 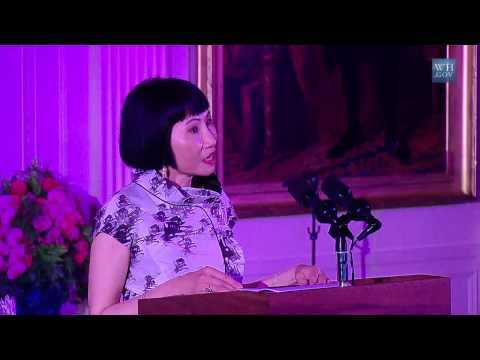 Amy Tan performs at the White House as part of a APA community heritage month celebration. She talk about her Asian American heritage and how it tied to the American dream. From her parents past to her book the Joy Luck Club, she shares how they intersect to create a truly Asian American heritage. You may relate to some of her own personal experiences in your life. This entry was posted in events on May 31, 2013 by Kevin Hsieh - channel APA. 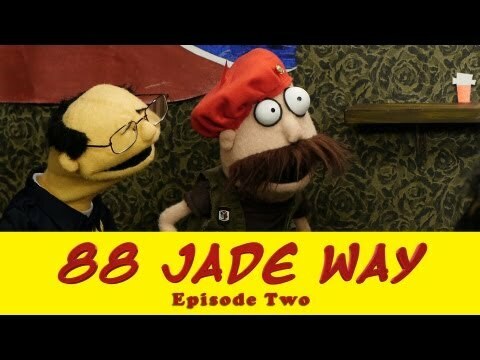 Web series 88 Jade Way continues with episode 2. The shady Mr. Moolah is back at 88 Jade Way, this time attempting to woo Gengha, the resident Mongolian alcoholic. Things get hairy when Red finds a monster in his closet – but Mr. Fu uses Gengha’s rage to help deal with the bizarre threat. Mr. Fu’s solution blows Red’s mind, while Mr. Moolah continues his mission to take over Fu’s building. This entry was posted in comedy, shorts on May 31, 2013 by Kevin Hsieh - channel APA. Arvind Mahankali (Speller 163) spelled “tokonoma” and “knaidel” correctly, smiling and nodding as he did. He is the winner of the Bee, and the first male champion since 2008. Knaidel is a German-derived Yiddish word. Arvind, who finished third in each of the past two Bees, has gotten out on German words. “The German curse has turned into a German blessing,” he said. Arvind said the words were extremely hard, and there were several he didn’t know — particularly “melocoton,” the word that eliminated fellow four-time competitor Grace Remmer (Speller 39). The New York eighth grader studied six hours on Sundays, but 30 minutes other days of the week. He said he plans to stop studying spelling and begin studying physics. “It means that I am retiring on a good note,” he said. Arvind hoisted the trophy over his head, with his parents and brother joining him on the stage. Before the finals, Arvind — who was the only competitor to return from last year’s finals — said he was feeling “pretty happy with my performance.” “Right now, it’s just fun,” he said. Arvind loves math and science and hopes to one day pursue a career as a physicist. That explains his choice of role model and the person he would most like to meet (Albert Einstein), but doesn’t explain his favorite song (“I Believe I Can Fly”). A speaker of Telugu and Spanish, Arvind enjoys tennis, basketball and drama, and counts Novak Djokovic and Shaquille O’Neal among his favorite athletes. 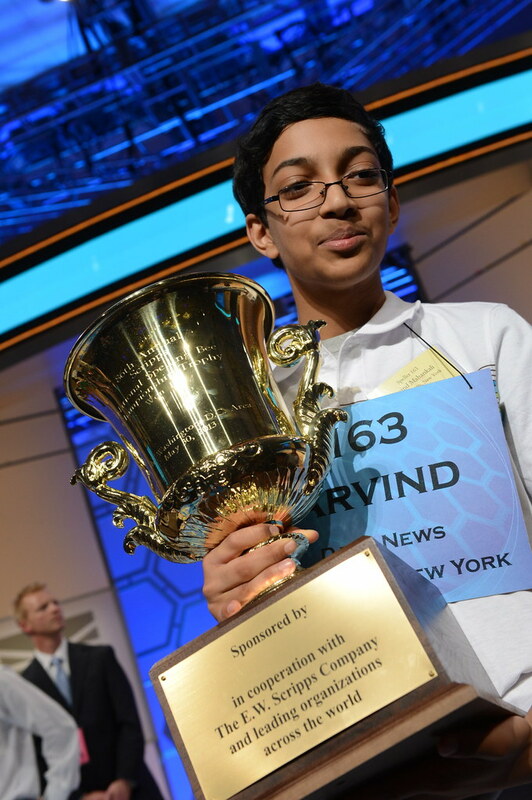 Arvind is making his fourth consecutive trip to the Scripps National Spelling Bee. He placed ninth in 2010 and finished in third place in both 2011 and 2012. Of all the words he’s seen and spelled, his favorite so far is sardoodledom. This entry was posted in contest, kids, tv on May 31, 2013 by Kevin Hsieh - channel APA. 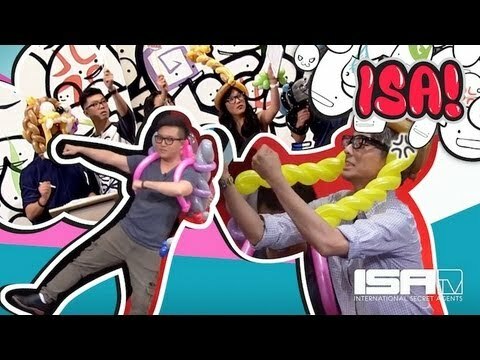 The ISA! Variety Game Show continues with episode 3. Hosted by Amy Okuda, Philip Wang, and gamemaster Yoshi (KevJumba), the show continues with some fun questions for contestants Ted Fu, Jen (FrmHeadToToe), David Choi, Clara C, Ally Maki, Freddie Wong, Brandon Laatsch, Wesley Chan, Mike Song, and Anthony Lee. Questions for the contestants include their favorite Pokemon, best viral dance moves, who would be the last standing in Zombie apocalypse, and who had the highest SAT score. This entry was posted in shorts on May 31, 2013 by Kevin Hsieh - channel APA. This entry was posted in shorts on May 30, 2013 by Kevin Hsieh - channel APA.